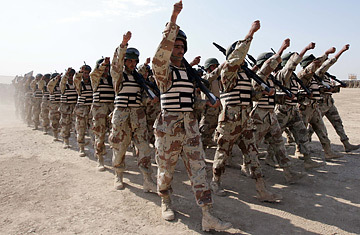 Newly graduated Iraqi soldiers parade at Bismaya military camp in the southeastern outskirts of Baghdad. In the east Baghdad neighborhood patrolled by Capt. Mike Juarez and the men of Charlie Company, 1-8 Cavalry, Iraq's most feared militia is keeping its head down. Since Moqtada al-Sadr's Mahdi Army declared a unilateral cease-fire at the end of August, the Americans have been able operate freely in some of Baghdad's worst areas, and have faced very few serious attacks. But in Juarez's neighborhood, as elsewhere, the militia retains an insidious weapon: a presence within the Iraqi government's security forces. On a recent night patrol Juarez and his men went door to door, discussing everything from electricity to security with residents. One home had a picture of Sadr, the militia chieftain, on display in the living room. It turned out that the man of the house was a member of the Iraqi security forces. In the back-and-forth that followed, the man told the Americans that he did not work with the militia, and did not have any colleagues who did either. Eventually, though, he said he might know a few cops or soldiers whose loyalties lie with the Mahdi Army ("Jaish al-Mahdi" in Arabic, "JAM" in the parlance of U.S. soldiers). The Americans left the man with a phone number to call so he could leave anonymous tips. Talking about the exchange outside the man's house, the Americans were skeptical. "He's probably in the JAM," said Lt. Michael Shevcik. The next day Juarez concurred. "Yes, one hundred percent. He'll never call." With the Mahdi Army's cease-fire mostly holding up, it's hard to say exactly how much influence the militia still retains within Iraqi police and army units. Officers in 1-8 say the problem has declined over the course of the year. But on the streets of east Baghdad the signs are less reassuring. Juarez and his men noted that the perpetrators of a recent rocket attack on their base had to pass through an Iraqi Army checkpoint, raising the possibility that Iraqi soldiers turned a blind eye. American commanders acknowledge that men affiliated with the militia are still working within Iraqi police and army units. But in areas like the one patrolled by 1-8 Cavalry  which borders the militia stronghold of Sadr City  anyone of any consequence is affiliated, at least to some extent, with the militia or Sadr's political organization. Determining where a soldier or policeman's loyalties lie is a complicated task. "Is there influence? Yeah, there are still individuals in Jaish al-Mahdi who are in the security forces," said Lieutenant-Colonel Jeffrey Sauer, who commands 1-8 Cavalry. But, says Sauer, being affiliated with JAM usually has no practical meaning unless a member of the the security forces acts in a way complicit with militia violence or criminal activity. The militia continues to intimidate civilians, a situation made worse by residents' lack of faith in their own police and army. The danger is that once the U.S. military begins reducing its presence over the next several months Baghdad's civilians will once again find themselves at the mercy of the militia. On the same patrol where Juarez and his men ran across the soldier with militia ties, they stopped by the home of a man who had occasionally filled them in on developments in the neighborhood. He told the Americans they needed to contact him less frequently; their visits were attracting attention and he feared he'd be killed as a collaborator. He said he could not rely on the Iraqi police or the government for protection, since he believed they were all part of the militia. The American asked for the names of policemen working with the Mahdi Army. "You need to narrow it down," he said. "Make a list." "It's all," the man replied, as the Americans prepared to depart. "All. Not one, two, three. All."